Thank you for sharing. I don't use Twitter so it's good to know where I can watch the games. The only things that are going to change, AFAIK, is CBS proper won't have a game most weeks, and part way through the season the TNT games will move to their streaming service thing. Well Salt Lake will be looking for a new kicker after today's game and that last kick is one of the worst you will ever see. Tom Dundon, Carolina Hurricanes owner: newest AAF Money Mark to the tune of $250 million! Two weeks in and this league can't even make payroll. Zorn playing the role of that New York coach who wasn't in on the angles with Jessie Ventura and could care less about it would be incredible. As a broke person, I'm not sure I'm in a place to give Tom Dundon financial advise, but why would you put $250 million into a league that was out of money after 2 weeks? That is about twice as much as it would take to fix the Flint Water crisis by the way...but fixing a second rate football league is much more important than that. How the hell can they be out of money after just two weeks? Having like 2,000 fans at the games in massive stadiums probably doesn't help. San Diego football is like indie wrestling. The promotions who can only get 2000 are running in stadiums that hold probably 20,000 while the NFL team that could easily hold 60,000 is probably running in a building that holds half that. 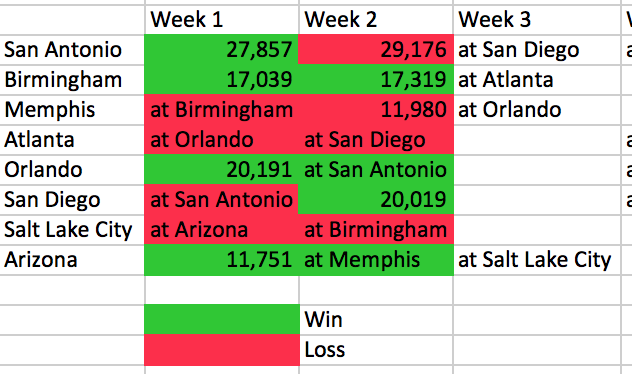 Interestingly, San Antonio's attendance actually increased from Week 1-2. They're outdrawing the Chargers, FWIW. Switching payroll providers sounds pretty odd to do in mid-season. I am firmly convinced that the folks that lightly toss the word "co-opted" at Meltzer over how the AEW stuff has been reported so far literally do not interact with any other types of media at all. Sports media, music journalism, video game media, film/TV press...Meltzer isnt even close to the level of "co-opted" multiple tastemakers in those worlds are. Sports media, music journalism, video game media, film/TV press...Meltzer isnt ﻿even close to the level of "co﻿-opted" multiple tastemakers in those worlds are. This is so true, especially in sports. Think about how many of the people covering sports leagues are also either paying or getting paid by that sports league. Think about how the NFL basically got a concussion documentary pulled from the air, or David Stern stopping Stan Van Gundy from being hired by ESPN, or the fact that almost every baseball team in a major market has its own network to cover their games. It's bad enough that people have their biases, but when the entire industry has biases you should always be skeptical of how things get covered. Dave Meltzer is actually one of the few "sports" journalists who I think is giving his actual opinion on matters, because he has a platform that exists independent of the sport he covers. Access journalism is simply the reality we live in.